Visit Yame’s best cherry blossom sites on VISIT YAME Bus Tour! Spots are secret until the day so that we will take you to the best place on the day. 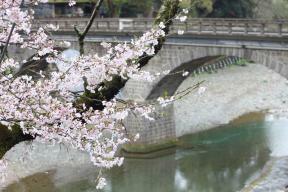 The popular spots in the past tours were the tunnel of cherry blossom trees at Muryojuin Temple, the long line of sakura trees at Yabe River, and the sakura by the stone bridge at Kitagawachi Park. Don’t miss gyokuro tea which is one of the highest grades of green tea available in Japan at the last spot.